There are many satisfying activities that we volunteers undertake such as neatly coppicing hazel or clearing a large area of scrub with brush-cutters but one of my favourites is building box strainers. Creating a box strainer that is pleasing to the eye and does its job perfectly gives a sense of achievement. In fact, we mostly always build two box strainers since you need one at each end of a run of fencing. So, what is a box strainer? It is a construction of two stout posts braced by a rail and wire that has to take the full tension of a run of fencing and also withstand the pressure of a large cow leaning against it. It looks sort of like a box – or maybe an elongated ‘H’. Digging and installation of the posts for the stock fence and creation of the box strainers. 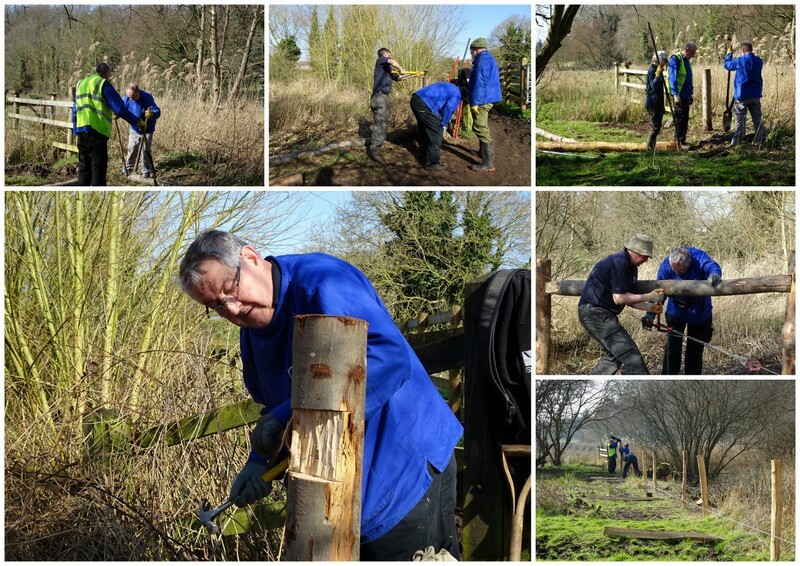 A few weeks back with storm Doris howling around our ears we removed an old fence line and coppiced the willows along the edge of a dyke on Marston Marsh. This week we made a return visit to install a run of around 80 metres of barbed fencing to prevent the cattle from getting across the dyke and onto Eaton golf course. First, we had to build a box strainer at each end using 8ft posts buried 4ft into the ground. However, at Marston the water table is about 2ft down and a layer of gravel started at 3ft. So, digging a narrow hole in a stony puddle is not easy and needs a bit of patience and perseverance. But we did it and got all four posts in place. The horizontal rails were inserted into chiselled-out slots and the whole thing braced with a few loops of wire carefully tightened with a wire strainer and held in place with gripples and staples. A bottom strand of barbed wire was tensioned between the box strainers and intermediate support posts placed every 3 metres along the fence line. Starting off with some fence posts and wire, we created a stock fence worthy of handling the weight of a fully grown marshland cow. The next day we returned to finish knocking the intermediate support posts in place and string the remaining two strands of barbed wire between the box strainers. This was tensioned as tight as possible and stapled to all posts. Not as easy as it sounds since that length of wire is quite heavy and is determined to roll itself back into a coil at every opportunity. It is also very sharp! Care is needed to tension the wire just right with everyone (other than the operator) standing back in case it decides to snap. 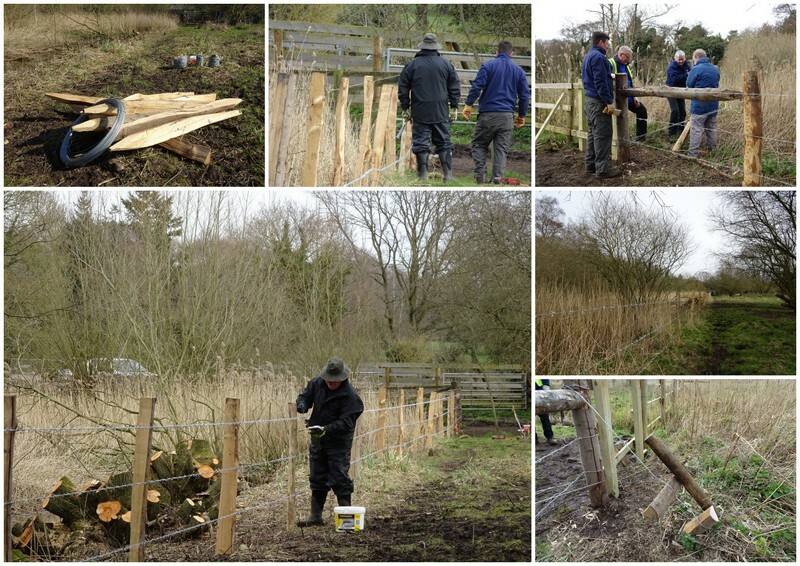 We then finished off the fence line with short runs of posts and rails to fill in the gaps between old and new fences. One of the box strainers needed to be stabilised in the soft ground so we constructed a Spanish Windlas with wire and posts to keep this in place. Another job completed was to brace the post and rail fence by the cattle corral to better withstand the weight of the cattle. 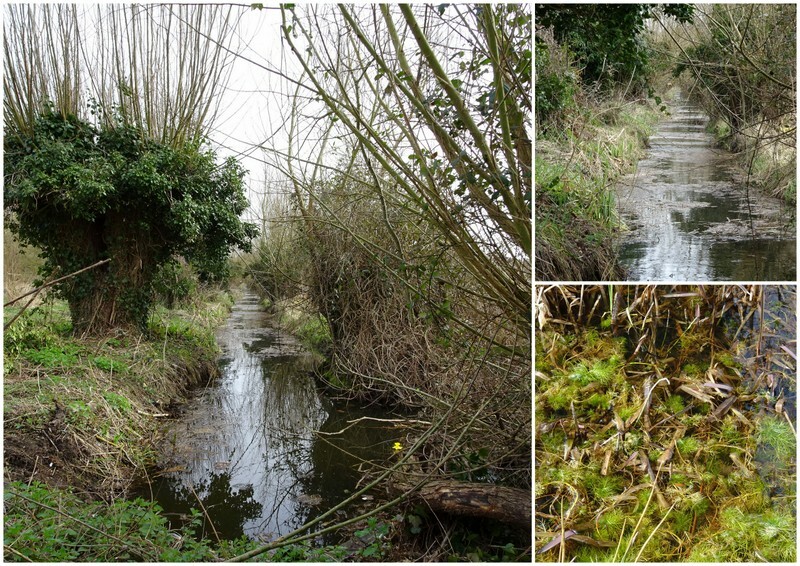 A typical dyke that can be found around Marston Marsh and the aquatic life that can found in them. As ever, a good and satisfying two days’ work at a great location on the fringe of Norwich. Marston Marsh is a very popular site with local dog walkers so is quite busy at all times. The resident little white egret was busy working its way along the dykes but kept away from us and the dog walkers.